Watterson’s Paige Woodford, front, and Olentangy’s Grace Pennington battle for possession during the first half of Thursday’s Division I District Tournament game in Columbus. 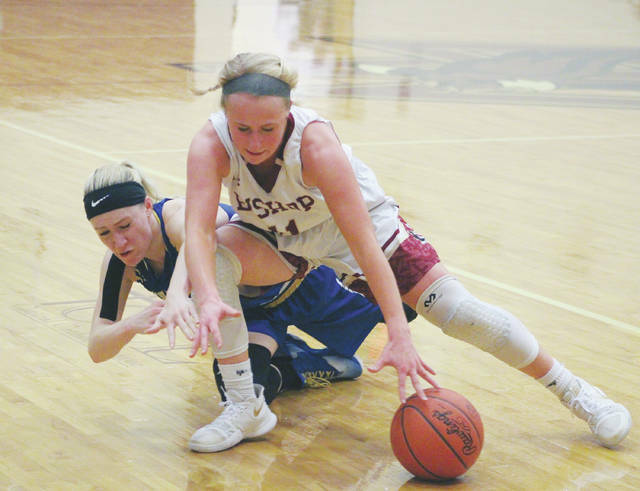 The Olentangy girls basketball team was held to two points in the second quarter and never recovered in a 52-36 loss at Bishop Watterson in the second round of the Division I district tournament Thursday night in Columbus. Elizabeth Rabold bookended a 6-0 run in the first quarter to help 13th-seeded Watterson take the lead. But, it was a 14-2 second quarter that allowed the Eagles to take control. Lainey Billing’s three-point play started the run and Paige Woodford knocked down a three-pointer to make it an 8-0 run, giving the Eagles a 24-10 lead. Molly Delaney briefly stopped the rally with Olentangy’s only basket of the frame. But, after a Grace Jenkins basket, Gretchen Glantzman scored back-to-back baskets, including one in the final seconds to give Watterson a 30-12 lead at the break. Glantzman scored six of her game-high 16 points in the second frame and Billing finished with 12 to lead Watterson (16-8), which led by as many as 23 in the second half. Maddie Goodman’s three-pointer capped a 7-0 rally by Olentangy to close the gap late in the game. Delaney finished with nine points and Jessica Nation added seven for 29th-seeded Olentangy (11-13). Watterson moves on to the district semifinal round and will face either top-seeded Newark or 50th-seeded Franklin Heights Wednesday night at 7 p.m. at a site to be determined.